Text: By a quarter to eight St. Martin’s Lane is filled with carriages, limousines and taxis discharging their human freight at the New Theatre as rapidly as the giant doorman and three “bobbies” can keep the line moving. For at eight (sharp) the curtain is to ring up on a new musical comedy. All the tickets have been sold five weeks before — and sold for real money. Sir Charles Wyndham, the New Theatre’s proprietor, does not believe in “complimentaries.” The only deadheads are the critics. Fortunately for six shillings I have been able to obtain a seat in the last row of the dress circle. The London theatrical manager who bought it has been called out of town. I happen at the box office as he is getting his money back. Can you imagine Abe Erlanger buying a theatre ticket in New York? Well, even Erlanger would have to buy his seat at any of Sir Charles Wyndham’s playhouses. The “first night” audience that finds its way to the stalls, boxes and dress circle is far different than one sees in New York. In the first place every one is in evening dress — full evening dress, if that makes it clearer. I don’t believe there is a dinner coat in the theatre and I am sure if any one had arrived in a sack suit he would have been barred. And of course there are no women in shirtwaists or “tailor mades.” Lo and behold, gowns are the rule and the only woman who wears a hat is an American actress — who should have known better. It is almost impossible to elbow one’s way through the crowd in the lobby — theatregoers in London have the New York habit of blocking the lobbies on first nights, with this difference — they are in their seats when the curtain goes up. It costs sixpence (12 cents) to get to a seat. An usherine collects it for a programme — one sort of graft New Yorkers won’t tolerate. 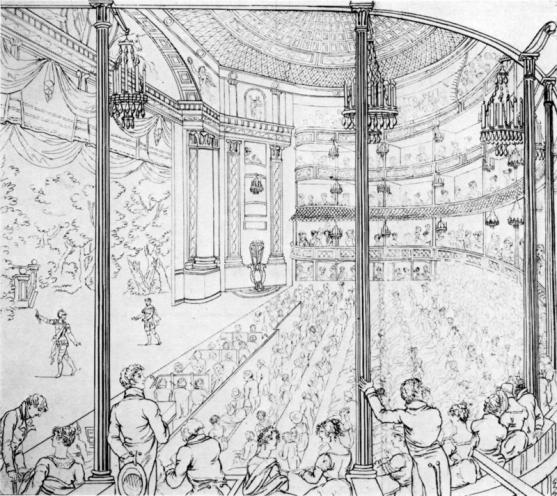 Stalls (orchestra chairs) are ten shillings sixpence ($2.52) at the box office, so theatregoing is more expensive in London than in New York. However, you even it up on the taxicabs. You can ride a mile for 16 cents and usually a shilling will take you to or from any theatre to your hotel. The dress circle, where my seat is, is on the street level, for in the New Theatre, as well as in most London theatres, it is necessary to descend a flight of steps to reach what we call the orchestra chairs. London theatregoers are not prejudiced against balcony seats. Many of the smartest people prefer the dress circle to the stalls, and the seats behind the stalls, which sell for $2 in New York are the cheapest in the theatre. In the right upper box are the Crown Prince of Greece, the Duke of Sparta and several ladies. Sir John Rolleston, M.P., occupies another box. Sir Charles Wyndham sits in the stage box with Miss Mary Moore. In the front stalls are Capt. Knollys, Lady Henry, Lady Wolesley and several other ladies of high degree — all bediamoned and bepearled — and all very homely. London does not boast of “first-nighters” as New York knows them. There are some “old bloods” who take in all the George Edwardes first nights — musical comedies at the Gaiety, Adelphi and Daly’s — but as a rule each theatre has its own clientele. Of course the more famous actors and actresses who are “at liberty” attend premieres. The only “regulars” are the dozen critics from the big London dailies. These critics, by the way, are so well dressed and so unostentatious that they cannot be distinguished from the “Johnnys” in the stalls. Nor do they leave before the play is half over to write their “stuff.” At least, I observed that they were all present when the final curtain fell. As is the custom in New York, the male portion of the audience seeks the lobby and neighboring bars during the intermission. They light cigarettes and even pipes. The bar in the theatre does a rushing business for about fifteen minutes. Every one at it takes brandy and soda or Scotch and soda. When the bell rings there is a rush for the stalls and boxes, where those who had remained with the ladies are enjoying coffee. At the intermission between the second and third acts I go behind the scenes where I see Lionel Montagu, Esq., R. Seligman, Esq., and Col. MacGeorge, three well known Londoners, come to congratulate Mr. Courtice Pounds, the star. When the final curtain falls there are cheers and “bravos.” The play is a success and the audience remains until Philip Michael Faraday, the producer, comes on the stage and bows his thanks. Then Arthur Wimperis, who did the book, is dragged out to bow his thanks. After more handclapping and cheering the audience moves to the lobby and the street to watch the celebrities enter their cars. It must be admitted that Miss Marie Lohr the actress, who is in the audience with H.B. Irving, attracts more attention than the Crown Prince of Greece. It requires the combined efforts of ten “bobbies” to keep the crowds back and carriages in line. Although the play is over at eleven o’clock, it is a quarter to twelve before the lobby is cleared and the lights turned out. The play? Oh, yes. 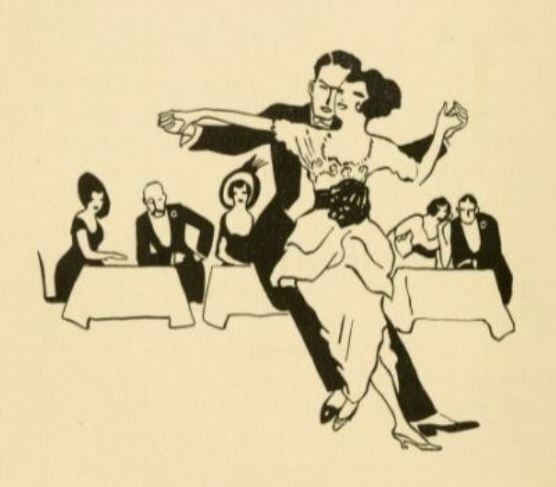 It was called “The Laughing Husband” — a Viennese operetta with music by Edmund Eysler. There is no need to describe it. You have seen it half a dozen times and you will see it again if you go to musical shows. Comments: Karl Kingsley Kitchen (1885-1935) was an American travel writer, newspaper columnist and bon viveur. The comic operetta The Laughing Husband, with book by Arthur Wimperis and music by Edmund Eysler, was based on a German original, Der lachende ebemann, by Julius Brammer and Alfred Grunwald. It starred Charles Courtice Pounds and opened at the New Theatre (now the Noël Coward Theatre) in London on 2 October 1913. Text: A first night at the Deutsches Theatre is an event. For the Deutsches Theatre is the first theatre of Germany — and in the opinion of many people the first theatre of Europe. Since it has been under the direction of Max Reinhardt it has won world wide fame and its premieres attract the most intellectual first night audiences in the world. A premiere at the Deutsches Theatre begins at seven o’clock but long before that hour every seat in the auditorium is filled. In the first place it is quite fashionable to attend first nights at this playhouse and what is perhaps more important, a considerable portion of Berlin’s population look upon the Deutsches Theatre as an educational institution of the first rank. It must be admitted that it is rather difficult to get a ticket for a Reinhardt premiere. Thousands want to go — and there are only twelve hundred seats. But if you are able to buy one you will be agreeably surprised in getting exactly what you pay for. Tickets in the first row at the Deutsches Theatre are 15 marks ($3.75) each. From the second to the seventh row they are $2.50 each and from the eighth to the fifteenth row about $1.88 each. If you can only get a ticket in the last row you pay but 75 cents — which is far more equitable than paying $2 for a ticket in the last row of a New York playhouse because the manager sells his best seats to ticket agencies to increase his receipts. However, there are no sharp practices in Berlin, as far as theaters are concerned. Like all the Reinhardt first nighters you arrive at the theatre ten or fifteen minutes before the curtain is announced to rise. You check your coat and hat and stick (for 2 1⁄2 cents per article) and allow an usher to show you to your seat. If you want a program you have to pay five cents for it, but it is worth the money, for with every program is distributed a booklet containing a dozen critical essays on the play you are to see. You have only to glance around the auditorium to appreciate the fact that you are far from Broadway. Although it is a first night there are less than a dozen people in evening dress. The boxes and loges are filled with men in business suits and women in what one might call afternoon gowns — if one stretched a point. To be sure there are a few dinner coats scattered through the first orchestra chairs, but there are scarcely six correctly attired persons in the audience — according to Broadway first night standards. And the spirit of the audience is entirely different from New York’s “I-dare-you-to-make-me-like-this-play” attitude. The men and women in the audience have come to see a serious production and when the lights are dimmed for the curtain to rise the theater is steeped in silence. There are no Diamond Jim Bradys to walk down the aisle after the curtain has risen. If you are not in your seat when the play begins you remain outside until the end of the first act. The play to-night is “Der Kaufmann von Venedig” — Shakespeare’s “Merchant of Venice.” Eight years ago Prof. Reinhardt produced this play at the Deutsches Theatre; but this season he is giving a “Shakespeare Cyclus” or repertoire of thirteen Shakespearean plays, extending over a period of six months. To-night is the first performance of the famous play in the present cycle and since it is an entirely new production all the critics in Berlin are present to review it. Engel of the Berliner Tageblatt, the Alan Dale of the German Capital, is in the fourth row. Close by is Claar of the Vossische Zeitung. Directly in front of me is a distinguished looking man who could easily impersonate the Christus in the Passion Play without make-up. He is Alfred Kerr, one of the leading critics of the theater in Germany. He is a “free lance,” but newspapers and weekly publications engage him to “cover” important openings. In the very first row is Prince August Wilhelm, the fourth son of the German Kaiser. Prince August Wilhelm is the civilian son of the Great War Lord. He is a highly cultivated young man, a doctor of philosophy, and he delights in being called “Professor.” His wife, the Princess August Wilhelm, is in the stage box with a party of royal guests. For while the Kaiser frowns upon the Deutsches Theater (it must be remembered he is in the position of a rival theatrical manager since he supports and practically conducts the Kaiserliches Schauspielhaus) that portion of royalty endowed with brains patronizes it on every occasion. Prince August Wilhelm attends every first night and is one of Max Reinhardt’s personal friends. The play is on. The audience is in Venice — not the Venice of a Forty-fifth street scene painter, but a real slice of Venice built by one of the leading artists in Europe. The Deutsches Theatre has a revolving stage which enables the scenes to be changed almost instantly. The first three acts are played consecutively in ten scenes. There is not a moment’s delay. The lights are dimmed, a rumbling sound is heard and behold! Shylock’s garden, Portia’s house or the Grand Canal is before you. Every scene is absolutely perfect — it is a veritable moving picture in colors with real people speaking the best German to be heard anywhere in the world. At nine o’clock the tenth scene is over and the curtain is rung down. For the first time in the evening there is applause. However, it is of short duration for the audience is intent upon other things. Berlin, like Vienna, goes to the theatre on an empty stomach and the “lange Pause,” as the intermission is called, is devoted to eating cold meats, salads and sandwiches and drinking much Pilsener and other beers. There is a restaurant in the basement of the theatre, a buffet on the balcony floor and a bar besides. All these places are filled to overflowing during the “lange Pause” Ex-Colonial Secretary Dernburg, who always attends first nights at the Deutsches Theater, munches a Blutwurst sandwich as he recalls the days spent in Wall Street learning frenzied finance. Prof. Alois Brandl, head of the English Department at the University of Berlin, and recognized as the first Shakespearean scholar on the Continent, chats with our Ambassador, “Jimmy” Gerard, who is as much of a first nighter in Berlin as he was in New York. They do not attack the food; for, following the American custom, they have dined before the theater. In the crowd around the bar are Prof. Bie, the famous art critic, Prof. Orlik, the painter, and Prof. Ordynski, who is Reinhardt’s right hand man, and who came to New York with “Sumurun.” All the leading intellectuals of Berlin are there or hurrying back to their seats so as not to miss a moment of the performance. At twenty-five minutes after nine the curtain rings up on the fourth act. It is played consecutively with the fifth act in seven scenes. At eleven o’clock the final curtain falls and there is a deafening sound of applause mingled with cheers. For five minutes this applause continues. Albert Bassermann, the Shylock, and Else Heims, the Portia, appear before the curtain again and again. But that does not satisfy the audience. They want Reinhardt. The cry starts in the gallery, it is taken up in the orchestra and spreads to the boxes. The Kaiser’s son is shouting for the producer. Prof. Brandl is making an inarticulate noise. Everyone is standing up, but no one — not even the critics — has left the theater. The audience has its way. The curtain rises and a smooth shaven, young looking man, in evening dress, walks to the center of the stage and bows. It is Max Reinhardt, the director of the Deutsches Theatre, and the foremost producer in Germany. The bow satisfies. There is another sound of applause followed by a rush for the exits. A first night at the Deutsches Theatre is over. Comments: Karl Kingsley Kitchen (1885-1935) was an American travel writer, newspaper columnist and bon viveur. Max Reinhardt (1873-1943) was an Austrian theatre director and producer whose radical approach to stage production made him one of the pre-eminent theatrical figures of his time. 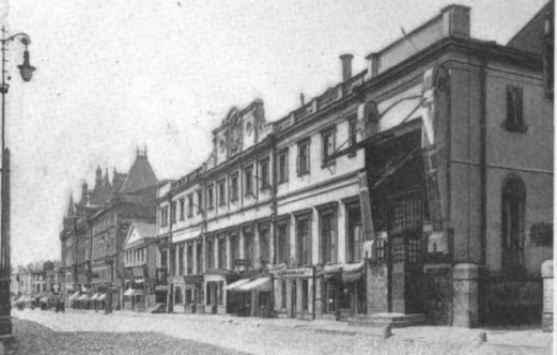 His Shakespeare cycle was held at the Deutches Theater, Berlin, over 1913/14. The role of Shylock in The Merchant of Venice alternated between Albert Bassermann and Rudolf Schildkraut.